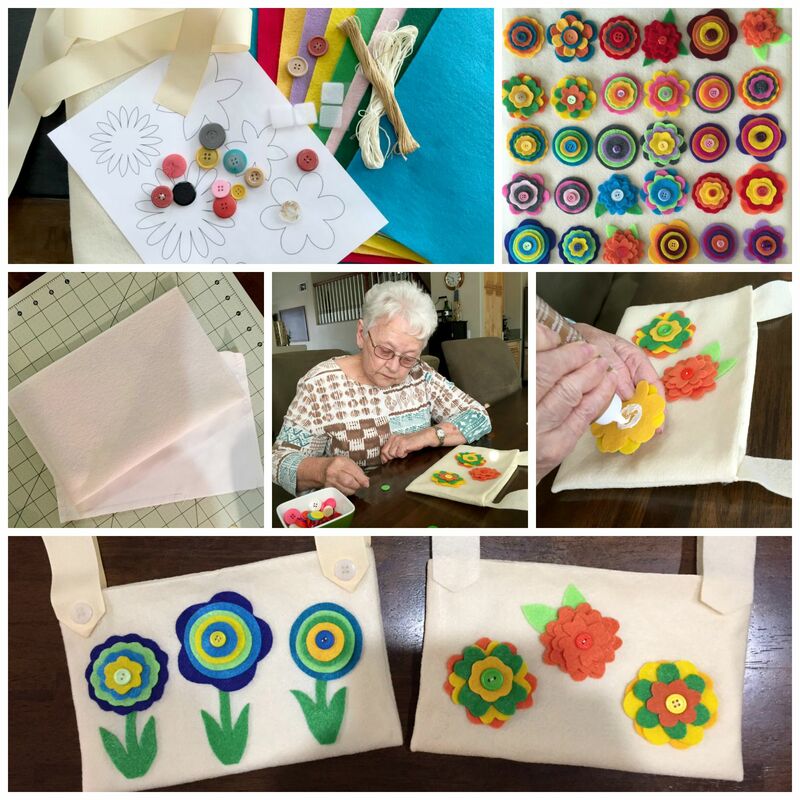 Felt Pouch Craft for Ages 3 to 90! A work related project commonly becomes a whole family affair in our home! Recently I had to come up with a craft project for 15 “90 somethings”. For this project I wanted something that would be fun and functional. If any of you have ever worked with the elderly you know that Bingo is one of the most anticipated of weekly activities. Our community is no different, and to make it even better our residents earn Bingo Bucks that can be used to purchase items at the Bingo Store. The thrill of the “BINGO!” just became even more exciting! After the game the bucks are generally tossed into a walker, stuffed into a pocket or plastic baggie, or mistakenly left behind when dropped on the floor. I thought it would be fun to make a small “Bingo Bucks” pouch for attaching to a walker or wheelchair for “buck” safekeeping. Originally I was going to make the pouches out of felt only. Then after talking and bonding with a fellow crafter at the neighborhood JoAnne’s Store, she suggested using a different fabric for the lining, as things tend to stick to felt. She was right, the first felt only pouch was not user friendly. At 90+ years the dexterity is not what it used to be and I wanted the pouch to be as functional as possible. So…even though it would require additional prep work, I reluctantly succumbed to the idea that a cotton blend fabric lining would be a better choice for this project. 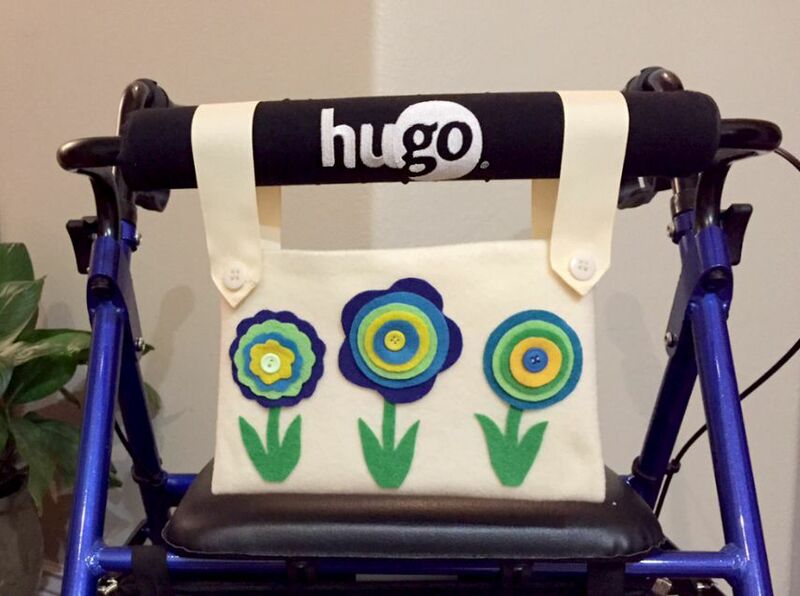 Ribbon or felt handles were added for looping around the front brace of a walker or arm of a wheelchair, then velcro was added for easy removal. As mentioned before, with a very curious and inquisitive 3 year old around, our projects usually have to be expanded to allow ALL to participate. 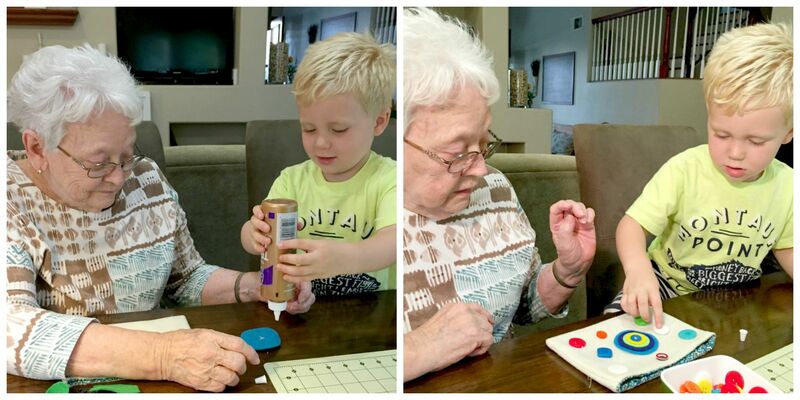 Great-Grandma assisted with gluing flowers and buttons onto a small tote for Noah. The family that crafts together, stays happy together! Where is Mom now… she’s in her bedroom patiently sewing button centers onto flowers. Nothing like getting the whole family involved. I appreciate her willingness to help prepare for the older folk. We expect a good turnout for craft hour tomorrow.